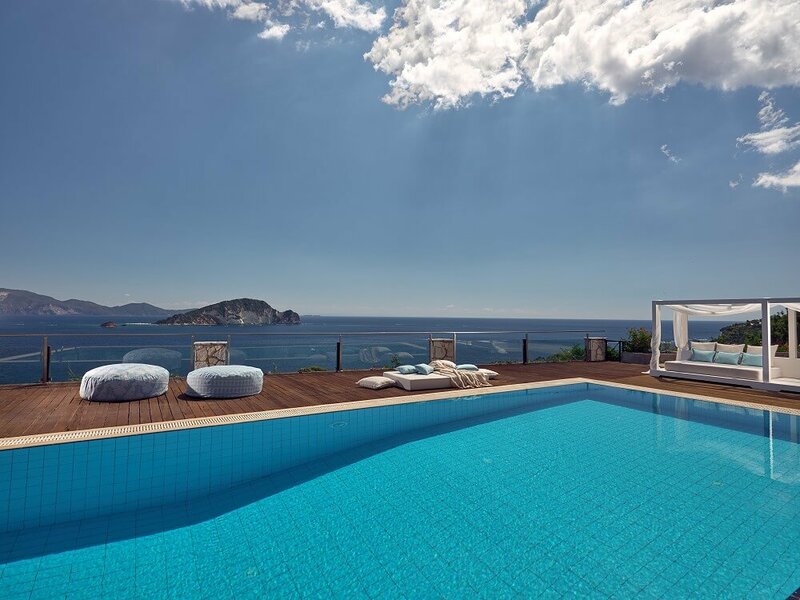 Built on a hillside, the majestic two-storied Serenus Luxury Villa overlooks the lovely Marathonissi Island and awaits its guests, so that it can offer them a unique stay of exquisite luxury. 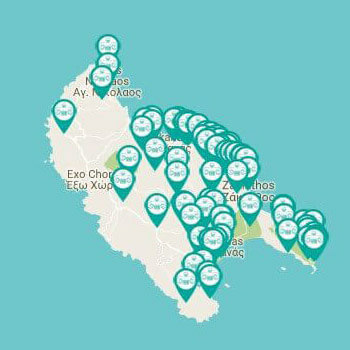 Coupling privacy with close proximity to popular tourist resorts (and a wonderful beach, which is a mere 200m away! 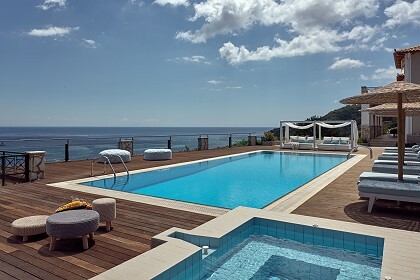 ), Serenus Luxury Villa is bound to cater to every need of yours – and offer you even more than you would expect. 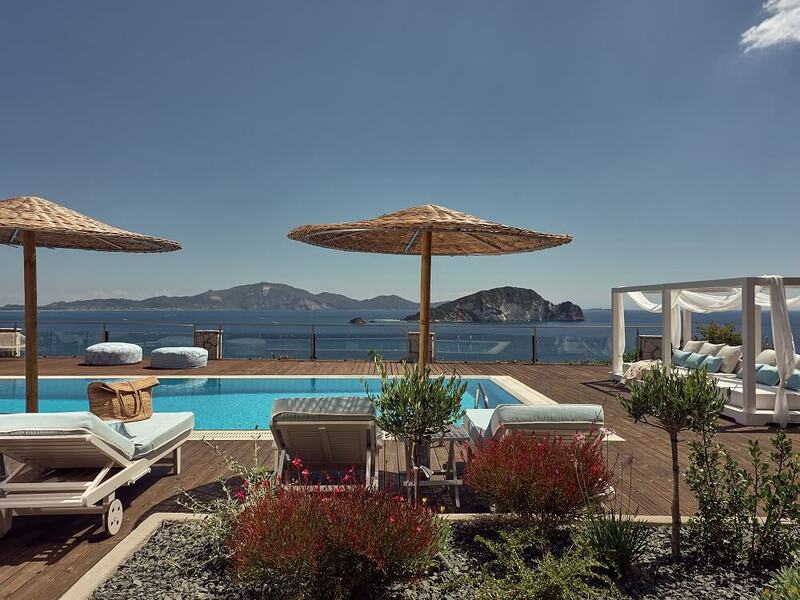 Spread upon two levels, the villa can accommodate up to 14 people in its six stylish bedrooms. On the ground floor, the guests will find a vast living room with a stone fireplace, a spacious modern and fully equipped kitchen, a bedroom with a shower and a WC, as well as an additional WC. 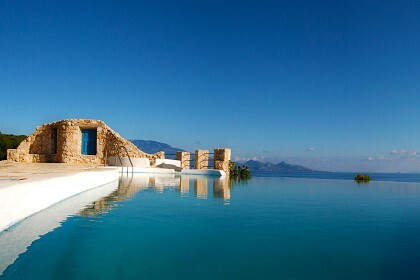 The ground floor features a wide terrace, which enjoys an unmatched view of the Ionian Sea. The upper floor offers a master bedroom, as well as three bedrooms. The two bedrooms share an en-suite bathroom with Jacuzzi, while the master bedroom has a private playroom with gym equipment and an en-suite bathroom with a Jacuzzi (shared with the fourth bedroom). The master bedroom is equipped with a king-sized bed, whereas the other four have two single beds each. 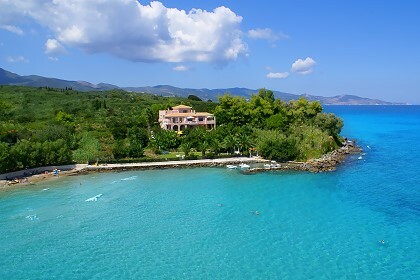 All upper-floor bedrooms have verandas, which offer a truly majestic view of Laganas Bay and the Ionian Sea. 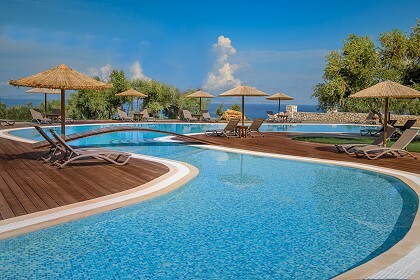 And, at last but most certainly not least, the spectacular swimming pool; a beautiful location to immerse yourself into, while relaxing under the summer sun. Serenus Luxury Villa offers, among many others, breakfast service, mini bar, pool towels and pool care, elevator, electronic safe, PC & WiFi and many more! Additional services, such as cooking service, laundry service and beauty treatments, can be arranged upon request and with a surcharge. 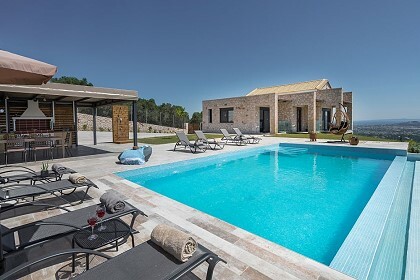 Serenus Luxury Villa is located in the southern part of Zakynthos Island, and enjoys a truly unmatched view of the Ionian Sea and Marathonissi Island. The nearest beach is located just 200m away, while the world-renowned Laganas tourist resort, home to the protected loggerhead turtle species, is a mere 11km away.